After a person passes away, his will is filed in probate court. Probate refers to the legal process of validating a will, appointing an executor and distributing the decedent's assets. The process for administering the estate varies by state and executors should review the laws in the state where the will is probated to ensure the procedure is correctly followed. 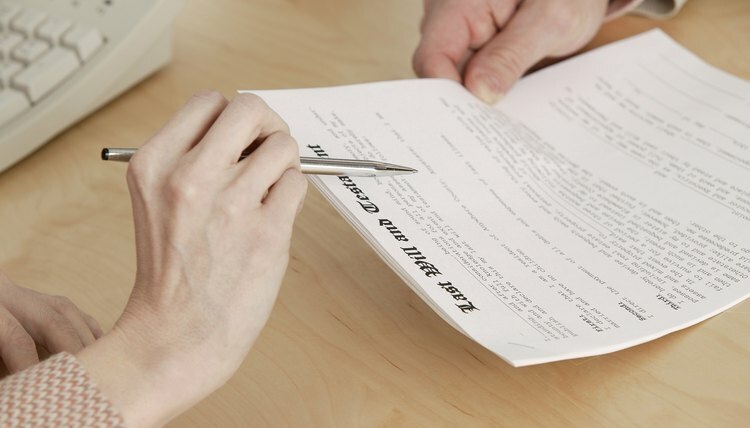 Generally, the testator - person who drafted the will - names an executor, or personal representative, in the will who is later officially appointed by the probate court. The executor is responsible for managing the administration of the estate according to the wishes of the testator. Throughout the probate process, the executor must act in good faith, and diligently and honestly carry out the wishes of the deceased. Executors are responsible for a number of duties in administrating the will, including collecting and preserving all the assets of the estate, paying debts, filing taxes and providing an accounting of all income, disbursements and other actions to the probate court. The executor is also responsible for dispersing the estate as the testator instructed in his will. After the will is entered into probate court and the executor is officially appointed, he has a number of steps to follow to administer the estate. Many executors, particularly if the estate is large and complicated, will hire professionals to help with the process, such as lawyers, accountants and appraisers. The probate process varies by state, but generally executors start with making funeral arrangements and collecting all relevant documents, such as deeds and bank account information. The executor must also notify all potential creditors, relatives and beneficiaries that the will is in probate. Next, the executor must collect and preserve all of the decedent's assets and file an inventory of the estate with the probate court. Debts, including funeral expenses, medical bills and taxes are typically paid first. If assets remain after all expenses are paid, they will be distributed to beneficiaries as provided in the will. If the executor does not perform his duties in good faith, he may be held personally responsible. An executor may be personally liable if any part of the estate is wrongly distributed to someone other than the testator's creditors or beneficiaries. In cases of gross negligence or severe mismanagement of the estate, depending on the laws of the state, beneficiaries may sue the executor for breaching his fiduciary duties. Executors and beneficiaries of a will have a unique relationship under the law. An executor’s role is to ensure the management of a deceased person’s estate complies with the decedent’s will and the probate rules of the state where he died. The executor also has a responsibility to the decedent’s beneficiaries to ensure each one gets the property the decedent wanted them to have, as defined by the will. This process can become difficult if the executor is also a beneficiary of the estate. Therefore, it is vital the executor and all beneficiaries have a clear understanding of what rights they have regarding an estate.